Star hurdler and London South Bank University (LSBU) law student Yasmin Miller has achieved her first gold medal in over two years, all while completing her final year dissertation. The 22-year-old from Canada Water had a number of ups and downs while representing Team LSBU at the recent BUCS Nationals, beating the Bucs Nationals record for 60m hurdles with a time of 7.22 seconds in the semi-final, and then narrowly missing out on the gold medal in the final by just 0.01 seconds. Then she followed up by claiming the gold in the 100m hurdles with a time of 13.6 seconds. “I was really happy to win gold at BUCS, as I hadn’t won anything in two years,” said Yasmin. But 13.6 seconds won’t be good enough for the goals she now has in her sights. She’s working on shaving it back to less than 13 seconds in hopes of qualifying for the World Championships. “Breaking 13 seconds is a big goal of mine but the speed is so fast and I’m still learning how to control the movement when I get to that speed,” she said. “I’ve started doing a lot of fast-leg training to fix that as I want to try and go to the European Athletics U23 Championships. With a busy schedule taking her to competitions and meets in Belgium, France and Poland in the next month, and with her final exams to think about as well, Yasmin acknowledges studying and training at the same time can take its toll. It hasn’t deterred her though, and Yasmin will be returning to LSBU for her LLM International Commercial Law in September. London South Bank University’s (LSBU) law courses have been recognised as among the best in the UK, with the release of The Guardian’s annual law rankings showing LSBU’s swift rise to 13th place, improving by 45 places from last year’s tables. 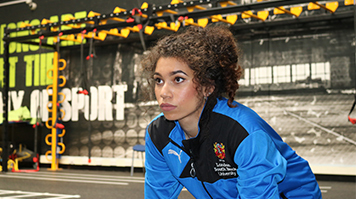 Find out more about LSBU’s Academy of Sport.